Cartier Resources Inc. (TSX-V: ECR) reports drill results grading 10.6 g/t Au over 6.0 m included within 4.5 g/t Au over 21.0 m both included within a 57.0 m section grading 2.5 g/t Au. As well, a section grading 7.5 g/t Au over 4.0 m is included within a 13.0 m section grading 3.2 g/t Au (FIGURE). All of these results are in the Zone 5NE of the Chimo Mine property, located 45 km east of Val-d’Or. The new results, which are situated at a depth of 650 m, are in addition to: 12.4 g/t Au over 5.0 m included within 5.9 g/t Au over 12.0 m (FIGURE), recently reported by Cartier, and within a 100-m radius of the new results. The potential of this area is open in all directions. Zone 5NE is located only 25 m from the 5M4 Zone and 450 m from the existing underground infrastructure at this depth (FIGURE). « The results recently obtained from Zones 5NE and 5M4 will monopolize the first part of the Phase III drill program in order to explore the continuity of the zones » commented Philippe Cloutier, President and CEO. Lengths are expressed along drill core axis. The true thickness was not determined. The Phase II drill program currently underway is focused on testing the potential of 7 peripheral gold zones to the main cluster of Zones 5. This program consists of 40 drill holes totaling 15,000 m.
The reader should view the YouTube VIDEO, available on Cartier’s website. The 3D video helps visualize the different gold-bearing structures on the Chimo Mine property as well as key components that are the mine infrastructures, the gold-bearing zones, the gold intersection areas left unmined as well as the main targets of the ongoing drill program. The Chimo Mine produced 379,012 ounces of gold (MERN DV 85-05 to DV-97-01). Cartier owns 100% interests of the property. Gold mineralized material was mined intermittently from 14 zones by 3 different producers. Mine infrastructure consists of a network of drifts distributed on 19 levels, connected by a 3-compartment shaft 965 m deep. The headframe and surface facilities were dismantled in 2008 but the electrical line and the sand pit are still present. A 105-hole drill program totaling 45,000 m (Phases I and II) has been underway since July 2017. 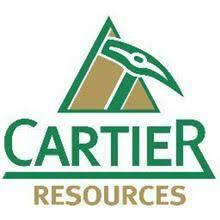 Cartier Resources was founded in 2006 and is based out of Val-d’Or, Quebec. Quebec has consistently ranked high as one of the best mining jurisdictions in the world primarily based on its mineral rich geology, attractive tax environment, and pro-mining government. In 2017, the Fraser Institute again ranked Quebec as one of the best jurisdictions in the world for investment attractiveness. All lengths, mentioned in this press release, were measured along the drill core. The NQ core samples are crushed up to 80% passing 8 mesh sieves and then pulverized up to 90% passing a 200-mesh sieve. Cartier inserts 5% of the number of samples in the form of certified standards and another 5% in the form of sterile samples to ensure quality control. The samples are analyzed at the Techni-Lab laboratory (Actlabs), located in Ste-Germaine-Boulé, Quebec. The 50 g pulps are analyzed by fire assay and atomic absorption. For samples containing visible gold, 1,000 g of rock are directly analyzed by the “Metallic Sieve” method.